Puppies and Kittens need a lot of time, care, attention and love. We can help with your newly arrived little bundles of joy by offering our Puppy & kitten Visits. We will visit your home and help feed and play with them, and of course clean up any little potty training accidents your puppy may have had. If required we allow your puppies into your garden/yard for a toilet break, offer praise and bring them back inside. When they old enough, we can offer a short walk around the block to introduce them to the collar and lead. Once your puppy is fully vaccinated we can begin to offer them slightly longer walks to help with socialisation. For kittens we clean and refresh water and food bowls as required, clean out their litter tray, and clean up any little accidents before comforting, playing with and pampering your little bundles of fur. Please note this service is also suitable for older dogs or those that are infirm. Discounts also apply for WEEKLY BOOKINGS. 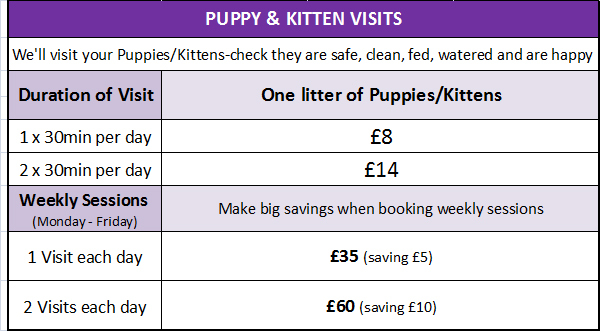 If we have confirmed your Puppy & Kitten Visits booking and you wish to pay online please use the relevant PAYPAL drop-down button below. Just as youngsters of the family need special care and attention, so do the older dogs. Older dog visits are offered to those in the autumn of their years who want to take it a little easier. This visit is also appropriate for dogs recovering from an illness or operation. We can let them out for a toilet break and give them that little bit of extra attention needed when you are not at home; you decide what the visit includes.